The prints in this exhibition grew from a collaborative partnership with a plant geneticist at Marquette University, Dr. Michael Shläppi, who is developing a variety of early-flowering / cold-tolerant rice to be grown in Wisconsin. Oryza sativa, domesticated Asian rice, is a staple crop that alone supplies over 20% of the calories that humans consume worldwide. Rice, like other cereal grains, is a grass; its domestication produced plants that retain their seeds through the end of the season (instead of dispersing them upon maturity), making the harvest of the grain economical. Over the millennia, varieties have been cultivated for myriad purposes, including productivity, drought tolerance, starch content, etc. However, rice remains a labor-intensive crop, and much of the industrial production of the crop takes place in regions of the world where labor costs are negligible. In Oryza, silhouettes of fieldworkers, drawn from historical photographs, prints, and paintings, populate the works. Their shadowy forms move through the rice fields—as they have for millennia—performing the tasks of cultivation, but the people remain indistinct. Illustrations of genetically modified rice capture the growth of the plant, from seedlings in petri dishes to fully mature grasses in test-paddies. Portraits of individual rice plants at various stages of growth are isolated for optimal examination, ringed with text, and edged in gold foil. The patterned backgrounds that extend like wallpaper behind the plants depict conditions necessary for farming (water / soil / air), as well as the crop itself, while referencing ongoing modifications and improvements to the organism. The historical intersections of art, science, and agriculture persist within the topic of rice, a crop whose cultivation and consumption defines the lives of billions of people throughout the world. Humans exert enormous selective pressures on certain organisms, essentially transforming constituents of the natural world to suit the needs of society. 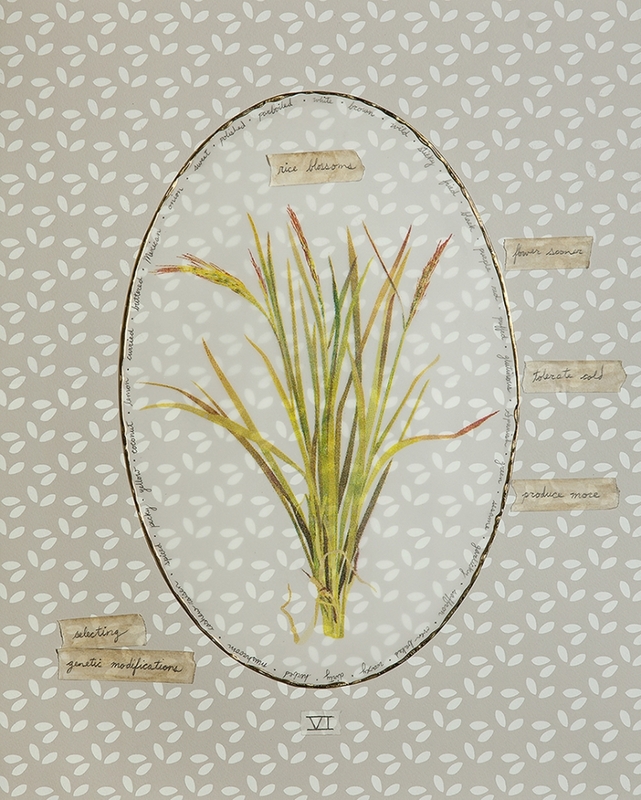 The decorative arrangements and stylized environments that typify the prints in Oryza acknowledge this history of control and manipulation, employing the aesthetic language of botanical illustration and situating the project within a larger discourse about labor in the studio, the laboratory, or the field. About the Artist: Cynthia Brinich-Langlois grew up in rural Alaska and was educated at Kenyon College and the University of New Mexico. She participated in Land Arts of the American West and the Tamarind Institute’s Collaborative Lithography program, and worked as an artist-in-residence at Elsewhere Artists Collaborative, Ucross Foundation, and RedLine Milwaukee. She has exhibited her prints, books, and video animations in shows throughout the United States and abroad, and is included in the Iowa Print Group archive at the University of Iowa, as well as the Land Arts of the American West archive at the Nevada Museum of Art.